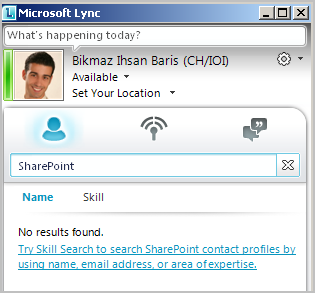 In this post I want to show you how to configure the skill search in Lync 2010. Lync uses the SharePoint Search Web Service to search after user skills.The skills are stored in the SharePoint User Profile Store. Enter a skill you want to search, here "SharePoint". Now click on Skill tab. You'll get a list of users who entered SharePoint as skill in their profile. 1. How to edit your skills. The skills are stored in the SharePoint User Profile Store. For that you have to enable and configure MySite in SharePoint. If MySite is enabled you can enter your profile page and edit your skills field. First open your MySite. Then go to the top right corner on a SharePoint page and open the personal menu. Click on "My Profile"
Now you enter the "My Profile" page in the MySite web application. I got this error while I was trying to install the Cumulative Updates August 2013. The reason for this error is that the baseline for all updates is the first Cumulative Update in March. and found out that I've installed the RTM version. This bypassed all checks so that you can force the installation. We have a Nintex Workflow and I need to send a list of documents in a folder to a customer as email attachment. Sound easy !! Although this could be an easy tasks unfortunately I couldn't find an easy way to do this, because the "Attachment" input element only takes a full path to a single file. That means you can't loop through a folder and collect all files with a seperator in a variable and give it to the attachment control. Or better would be to collect all paths in the "Collection" variable and give this variable to the attachment control. This also does not work in my Nintex version. Maybe the Nintex guys already added this feature. The only way I found is to save each file in a separate variable. So I had to make a restrictions like, "I've maximum 5 attachments". The "Save as Template" option in the list settings does not exist. This is because this type of list is deprecated. In SharePoint 2010 you should use Enterprise Wikis.After copying the list, the links in the wikis site must be adapted to the new site. Ways to copy the Wiki Library The are three "easy" ways to copy the Wiki Library from one site to the other. The "Save As Template" Link does not exist in the Library Settings but the option still exists. SharePoint Designer Open the site with the SharePoint Designer. Click on your wiki and go the the library settings. You'll find a "Save as template" button there. There are lots of stuff in the web around how to create a FAQ in SharePoint. In this post I'll show you some tricks what you can do with additional OOB SharePoint tools to have also some search and some style within your FAQ to impress your customer. It also shows you the power of SharePoint as a developer platform. The following image shows us the final page. Our FAQ page has a FAQ list and a document library. This is useful if you want to link on some documents in your FAQ. 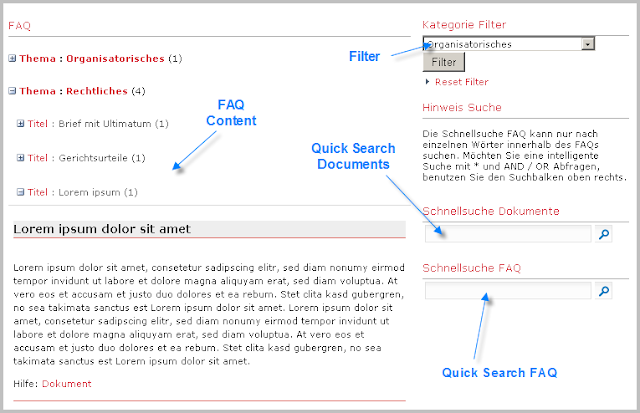 The page has a list WebPart with a special grouped view and also2 quick searches for documents and for the FAQ list. I got this error while installing SharePoint 2013 with AutoSPInstaller. Check if Windows Web Services Pool has startedCheck if "Claims To Windows Token Service" has startedCheck if IIS checkbox "enable for 32bit Applications" is checkedProvisioning the Security Service againCheck if the "Claims To Windows Token Service" is running under Localsystem accountCheck if in IIS > Windows Authentication "Enable Kernel Mode Authetication" is enabledAnd Reinstalling SharePoint I got still the same error.